Track lions on foot - thrilling! Luwi Camp is a seasonal camp nestled under huge mahogany trees on the banks of a permanent lagoon. Accommodation is in just four huts constructed of grass and thatch with polished mud floors. All have ensuite bathroom. A small thatch provides shade over the bar area. Daytime meals are served in the shade of the trees with a view of the grassy plain that normally attracts an abundance of wildlife, whilst dinner is taken under the stars accompanied by the many sounds of the African night. There is a large lagoon adjacent to camp that teems with hippo and crocodile. This permanent water source attracts game from far and wide making the camp area constantly busy with animals. There is a hide by the lagoon allowing you to view animals up close. Luwi is one of the camps situated deepest in the Luangwa wilderness, lending the camp a rustic appeal and providing a truly African bush experience. Since there are very few roads in this area of the park, the emphasis from Luwi is on walking. Open: Mid May to Early November (Specific dates each year - please ask for details). Location: Located deep in the heart of South Luangwa National Park on the seasonal Luwi River. The camp is located among shady mahogany trees near a hippo-filled lagoon. Rooms: 4 luxury huts constructed of grass and thatch, with en-suite shower rooms. They are dismantled at the end of each season and re-built at the beginning of the next, as is the whole camp. 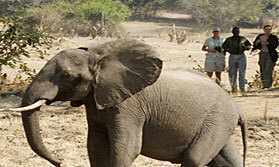 Activities: The camp specialises in guided walking safaris, for which its remote setting is ideal. These often include opportunities for lion tracking. You can also take day and night game drives, and go birdwatching. There is a hide by the lagoon for close-up views of hippos, crocodiles and birds. This is a favourite spot for sundowners, too. Facilities: A small thatch are provides a welcoming, cosy bar area. There is a viewing hide by the lagoon. Dining: Meals are served communally in the open, beneath the shade of trees by day and under the stars at night. Communication: There is very limited mobile reception, no direct â€˜phone or fax and no internet. Waste paper is recycled into briquettes for the fire, they sponsor over 100 local students through education, they plant trees and back the South Luangwa Conservation Society. Their local impact is very positive. "If Kuyenda matches the 'house made of straw' image, then I'd put Luwi in as a strong contender! This is a true bush camp - deep in the heart of the park and very rustic indeed. For those who love the great outdoors and being far from cilvilisation it's superb. There are also fairly frequent sightings from here of the Luwi pack of wild dogs. I would combine this with another camp on the river front, so you get a contrast in scenery during your holiday."